In the light-filled Centre Gallery of Sirius Arts Centre in Cobh, County Cork, behind layers of liner paper and white emulsion, lay, until recently, a very well-kept secret. 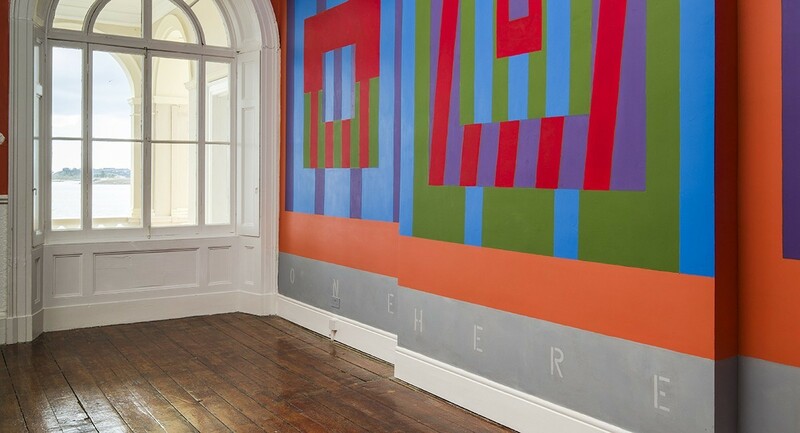 One, Here, Now is a nine-part series of spectacular floor-to-ceiling wall paintings by the New York–based Irish artist Brian O’Doherty (formerly Patrick Ireland), which were made in 1995/96 and subsequently covered over for the following twenty-two years. Led by Sirius Arts Centre Director Miranda Driscoll, an ambitious project was launched to celebrate the temporary restoration of the murals in 2018 by conservator Don Knox: a year-long series of new partnerships, commissioned artworks, compositions, performances, and talks to honour, re-interrogate, and, most importantly, preserve these important works for future generations. One Here Now: The Brian O’Doherty / Patrick Ireland Project, co-published by Sirius Arts Centre and Paper Visual Art, comprises essays on each of the projects and discussions on O’Doherty’s work. It reflects on this important year at Sirius Arts Centre and serves as a legacy of the murals that will be covered up again in May 2019. The book will be launched by Frances Morris, Director of Tate Modern.